Code is text. Like every natural language, programming languages have strict grammar and syntax rules. And like in typography, there are formatting rules. We can read and understand poorly formatted books, but it might be difficult. The same applies to source code as well. Well-formatted code helps us understand program structure. Of course, different languages have different formatting styles. Wrong or unusual formatting makes code look awkward and dumb. Programmers often argue about code formatting. One of the most popular topics is Tabs vs. Spaces. The problem is that you cannot visualy distinguish them and tabs may be displayed differently on different computers and in different code editors: either as 8 or 4 spaces (or any other number of spaces, actually). Besides visual, in some cases they have semantic difference too, like in Makefile or in Python code. A recent extensive research should put a stop to it: spaces are far more prevalent in modern programming languages. And take a closer look at Python, in which indentation is crucial for program structure: spaces are used 20 times more frequently. 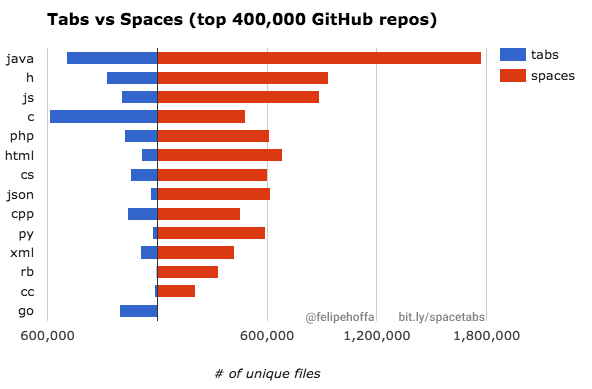 The only language programming language where tabs prevail over spaces is C. Here I would love to see the per year breakdown of newly created files with different indentation styles. Because it might well be the case that recent contributions are using spaces and they may soon take the lead in C language too. Just take a look at this Wikipedia article discussing all known brace and indentation styles. Great that all modern programming languages provide style guides and nowdays I see less arguments on where to put a brace. Because what can you object to those, who name their preferred style 1TBS: One True Brace Style?! By the way ESLint is a great example of how good idea can be abused by some Grammar-Nazi style rules, like string quotes one or one forcing proper indentation. And given that it is usually set up to fail CI build in case of any found problem, I feel I sometimes spend more time satisfying eslint than writing any meaningful code. The same applies to Go programming language. Its creators even brought it to the next level and made formatter a part of official language tooling. Many open-source projects reject improperly formatted pull requests, so contributors must not forget to execute go fmt before committing. When it is all about personal preferences, version control systems might have come to the rescue. Git already converts line endings according to the user’s OS standard. It has extensible hooks on push, checkout and commit. If only there was a tool, that can convert formatting back-and-forth between user’s preferred style and the style used in the repository; then it could be applied automatically and save billion of hours spent on arguments and reformatting. A related issue, which is not fully resolved yet, is a semantic diff. Current diff/merge tools are rather dumb and apply changes based on lines of code. This way it is easy to loose a small change in the middle of a method if it was shifted few spaces due to formatting update. WTF?! Please, please never do this. There is a tool SemanticMerge which aims to solve this and other merge issues, but I haven’t tried it yet. I admit that consistent coding style is important for the sustainability of the codebase. Formatting style is an important part of code style, but don’t overrate it. It doesn’t worth it to argue a lot on code formatting. If it looks nice—great, but it’s far more important that it is correct, maintanable and fast. Stick to some style across the whole team and just forget it. It is absolutely important to set up automatic code formatting in your IDE of choice. When team IDE preferences vary, EditorConfig may help, it is suppported by all popular code editors. And let’s create better tools that would not force us to apply bad-smelling tricks to our code.